Hosting Partner Review 2019: Is Hosting Partner a Good Hosting? HostingPartner has been a trusted provider of shared and VPS hosting since 2009. They offer affordable hosting plans and support for both English and Italian on their website. Based in Torino, Italy, HostingPartner is a trusted provider of shared and VPS hosting. They offer affordable hosting plans and support for both English and Italian on their website. Their Windows and Linux shared hosting plans are their two major offerings. Both have intuitive control panels that allow you to easily manage your hosting account. Add-ons include the Softaculous one-click installer with over 300 apps available, a free domain registration for the lifetime of your hosting plan, and SSL certificates. The free domain was an amazing bonus, given that most hosting providers only offer the first year of domain registration for free, if at all. HostingPartner also offers a number of plans specially optimized for a select few CMSes, including WordPress, Joomla!, Moodle, PrestaShop, and Magento. These packages come with the selected CMS pre-installed, which cuts down your setup time. Also, like their shared hosting plans, you get a free domain for the lifetime of your hosting plan. HostingPartner offers a 99.9% uptime guarantee, though their service almost always exceeds this uptime rating. Plus, with their Linux hosting servers, you’ll never have to worry about server performance or website speed: they use Nginx and CloudLinux, which drastically boosts server efficiency and guarantees that your websites will load up to 10 times faster. You’ll also be happy to know that HostingPartner provides daily backups. This is taken care of automatically on the backend. If at any time you want to roll back updates or changes, you can do so easily with their simple restoration tool. 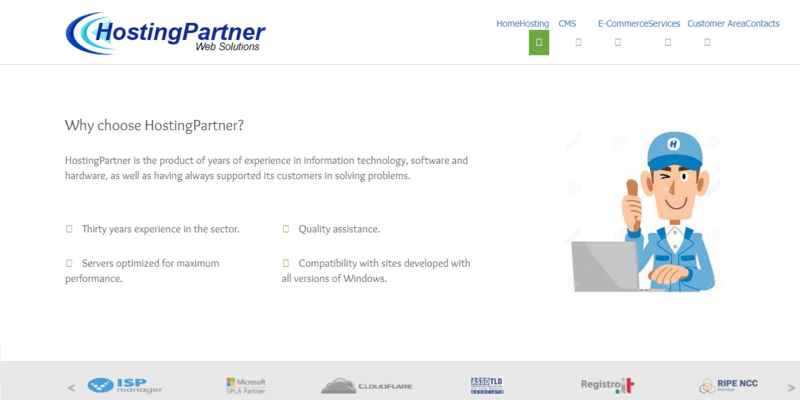 To help them manage their accounts, HostingPartner provides all of their customers with the ISP Manager Control Panel. This gives you access to every aspect of your account, including your emails, databases, and visitor analytics. The interface looks a little dated and text-heavy, but it does get the job done well enough. Under shared hosting, there are four types of plans; Entry, Basic, Business, and Advanced. The Linux and Windows plans have more or less the same specifications. Depending on your package, you will get 512MB-20GB storage space, 5-80GB monthly bandwidth, 5-20 subdomains, 5-30 email boxes, and 5-20 MySQL databases. All four plans include a free domain and basic SSL. HostingPartner’s plans are priced slightly higher than top competitors in the industry, but the trade-off is that their servers are well-located to cater to the Italian market. Also, not many hosting providers include a lifetime domain registration with shared hosting plans, so that’s something to consider as well. Switching between hosting plans is simple; all you have to do is contact their customer support, and they’ll handle everything for you. On top of that, you don’t have to wait for your current plan to expire in order to make a switch. HostingPartner backs their services with decent — though not amazing — support. You get access to sales and technical support via phone from 9am-12pm and 3-6pm from Monday to Friday. If you submit a ticket, they promise to get back to you within four hours; with email support, you’ll get a response within 24 hours. HostingPartner offers a variety of fast and secure hosting plans with 99.9% uptime. They’re a good choice for personal websites, bloggers, and small to mid-sized business in Italy; however, if you require enterprise-grade solutions, you may have to look elsewhere. Wondering how Hosting Partner stacks up against other Web Hosting companies? Enter any other Web Hosting company and we will give you a side-by-side comparison.